A brand new LOGO for a brand new year! Hi friends, I've been thinking a lot about branding lately, and I have decided that 2011 will be the year that I take my work and my "brand" (me?) to a new level. For many years, I have been too busy creating artwork to give any concerted thought to marketing myself. My 'logo' has consisted of my name slapped across any one of my painting images and used as a banner, facebook icon and/or business card (sometimes all 3 have been different!). And this year, when the bag & luggage company, Sherpani, began using my artwork for their catalogue and advertising, I realized it was time to become more consistent and professional. So here is my new logo! I hope that you like it. I've tweaked it a bit for the banner, but the base is above. I like it because it is designed entirely by hand using my encaustic process, and I've "branded" myself as primarily a wax artist. As I embark upon this new marketing push, I will share my journey with you on the blog. I know there are many artists out there struggling to promote themselves in the same way, so this will likely prove interesting to everyone! In the meantime, wishing you a joyous and bright New Year!! Original is sold, but prints available here. 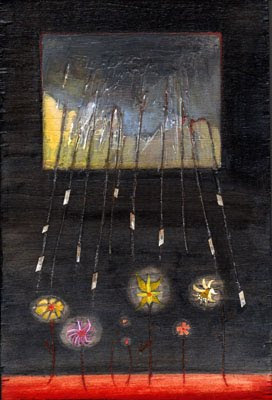 I painted"Box of Rain" a few years ago, but it has emerged in my consciousness lately. And I know that it's been on my mind because the weather inside of me is as rainy as the weather outside right now. I feel as though my heart and mind are a 'box of rain' that is on the verge of overflowing like a huge cumulous cloud in a thunder storm. But when I look at this painting, it reminds me that rain -- much like the sunshine in my last FAF painting -- can also bring flowers. Both the rain and the sun are agents of growth, and as an artist, it's important to honor both sides of the emotional spectrum. So today I am paying homage to the rain. Here are the lyrics to the Grateful Dead song that inpsired the title (and the feeling). I love this song - it feels like the box is a gift. 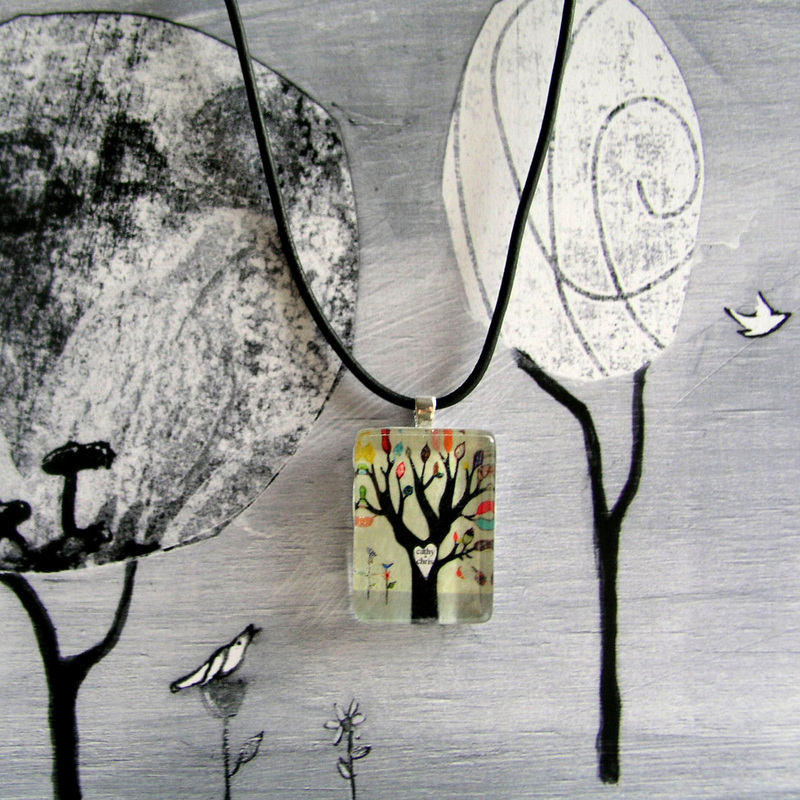 I'm so happy to share this interview I did today over at Art Biz Mama. I just love Dana Barbieri's blog and the many stories she shares about moms and their creative businesses. I tried to share a few words of wisdom about the process of balancing motherhood and my art business (though to look at my car you might feel that 'balance' is a bit of a myth). :) The funny thing is that really and truly, I don't believe that painting keeps me balanced. I think it helps me remain just unbalanced enough to lift off the ground sometimes... to sprout wings and look around from a new perspective. "Let the Sun Shine" by me. Original is sold. Prints are available upon request. Though we have only two entries this FAF, I am so honored to display this gorgeous piece by Claire beside my own rendition of 'gratitude.' Claire writes in her blog that her submission was inspired by gratitude for life with her husband and children. The way she has placed the two teacups alongside a blooming flower reminds me of the healing power of simple rituals and acts of kindness. Thank you, Claire, for sharing your work! 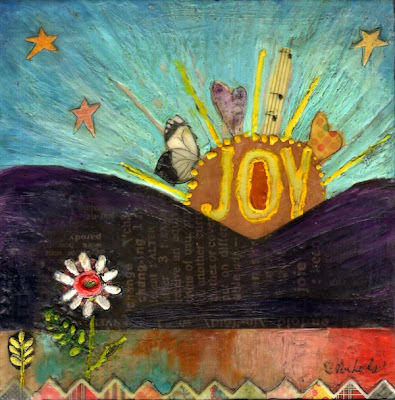 My own piece was inspired by gratitude for the simple joys we find in life. These are like rays of sunshine that warm our quiet days. I hope that you and your family found much to be thankful for this Thanksgiving as well! 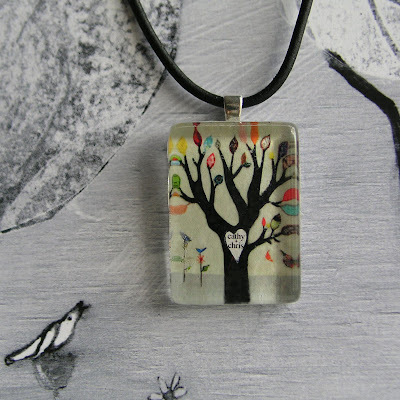 "Mommy Tree Talking to Baby Tree" pendant necklace. Now available here. 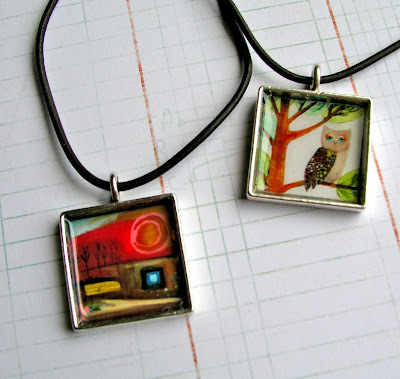 I've been making lots of jewelry lately and enjoying these little photographic tableaux. The hang tag for this piece features a detail from my painting "i carry your heart" - from the ee cummings poem. I thought it was a nice combination for a gift from mother to daughter or vice versa. 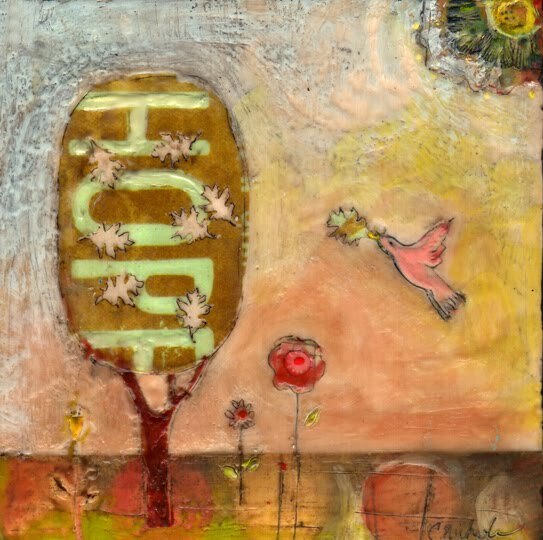 Speaking of people we are grateful for (like moms), this Friday is Found Art Friday, and our theme is "gratitude." If you feel like joining in, this might be a fun way to push yourself to do a little 'thanksgiving' gift to share with those you love. Just send me a jpeg or a link to your piece on your blog, and I will post the selections this Friday. My new "Forever Falling Tree" personalized pendant necklaces are now available at my Etsy shop. I have been working on this idea for a few weeks now, and I've finally figured out how to put these pendants together. Each tree can be customized with a set of names or initials (or just with one name). This one features my name with my husband's -- though I had to shorten "Christophe" into Chris! It's really fun to wear this -- it's like a teeny tiny secret or a message in a bottle. Not obvious to the casual observer, but clear to those who are paying attention. Now at Caffe Portofino for the Holidays! 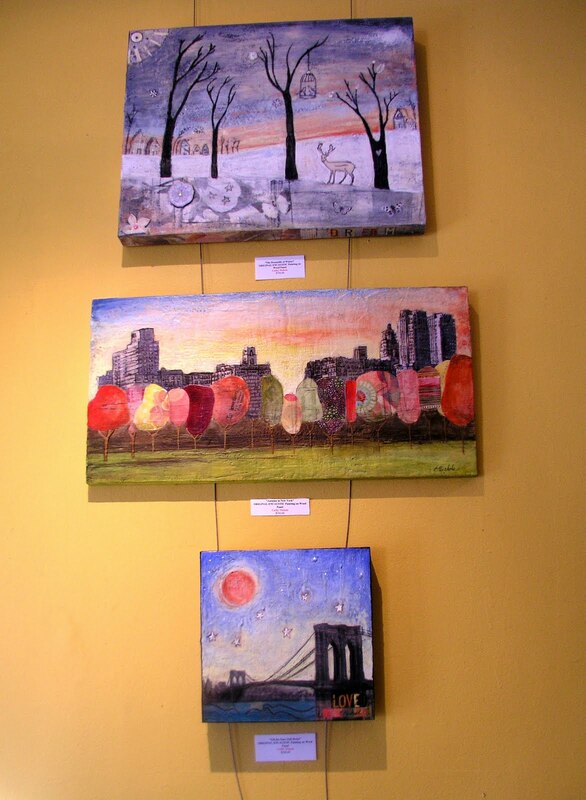 It was a blustery cold night yesterday when we hung my paintings at Caffe Portofino, but the delicious hot chocolate kept me nice and warm. 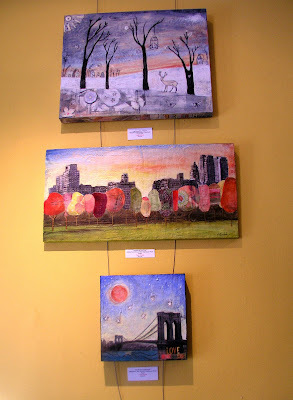 Now through the end of December, you can see my work at my favorite local cafe. 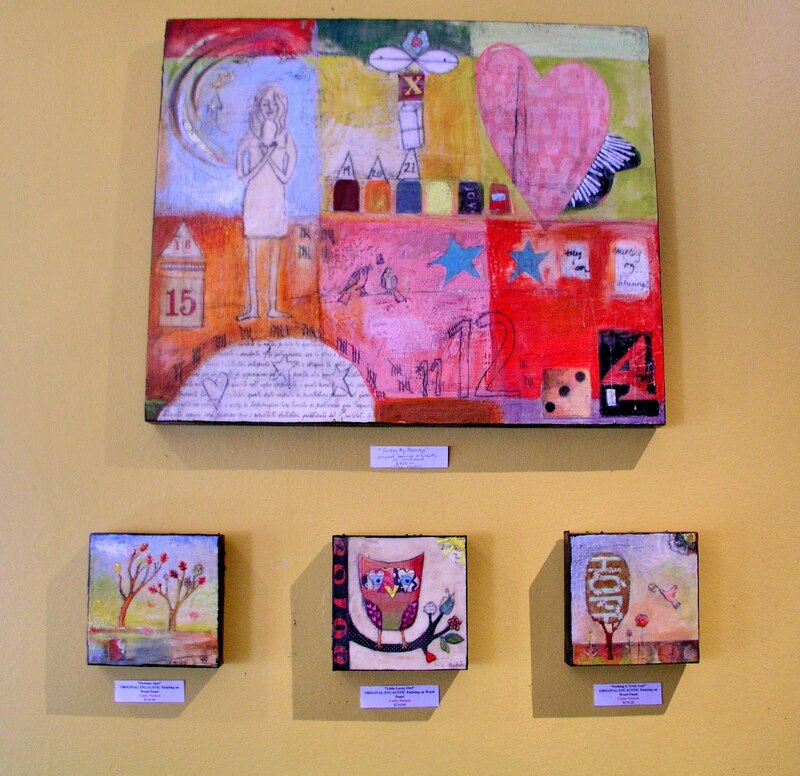 Pictured here are "Counting My Blessings," "October Jazz," Little Lovey Owl," "Nothing is Truly Lost," "Only the Beginning," and a giclee of "Mommy Tree Talking to Baby Tree." Here are "The Dreamlife of Winter," "Autumn in New York," and "Until the Stars Fall Down." 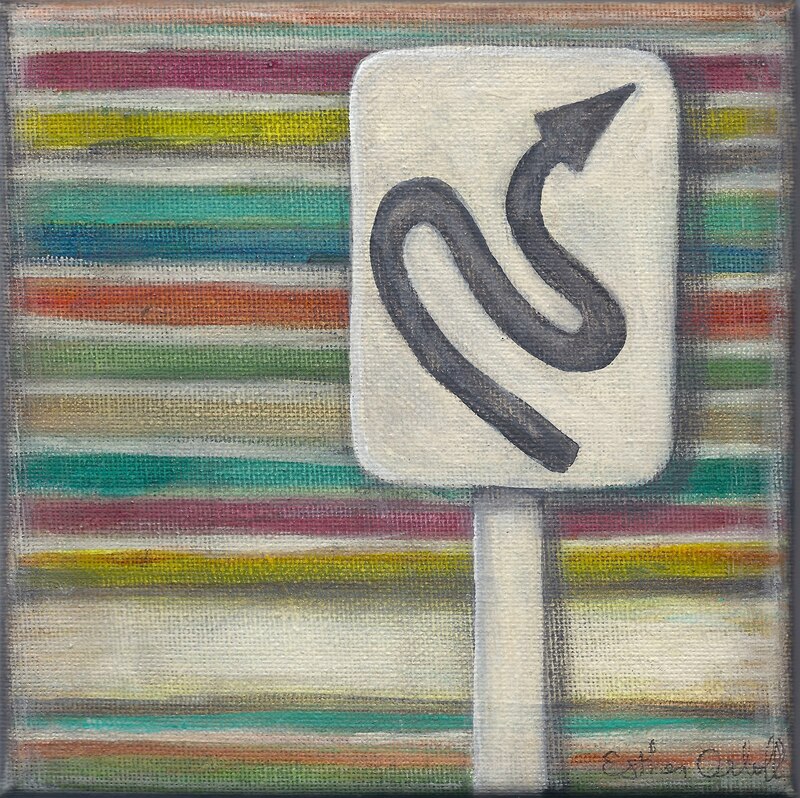 "Counting my Blessings" original 24x24 inch painting on 1 and 3/4 inch cradled wood panel. Original for sale here. This is my new, more abstract piece, and it expresses a sentiment close to my heart: gratitude (our FAF theme next month!). Sometimes we can get bogged down in the little things that don't work out during the day and we forget to be grateful for everything that is already going just right. I think of those right things as bright colors melded into a quilt that keeps us warm and supported behind the scenes. In this piece, I've literally counted... up to the infinity symbol. 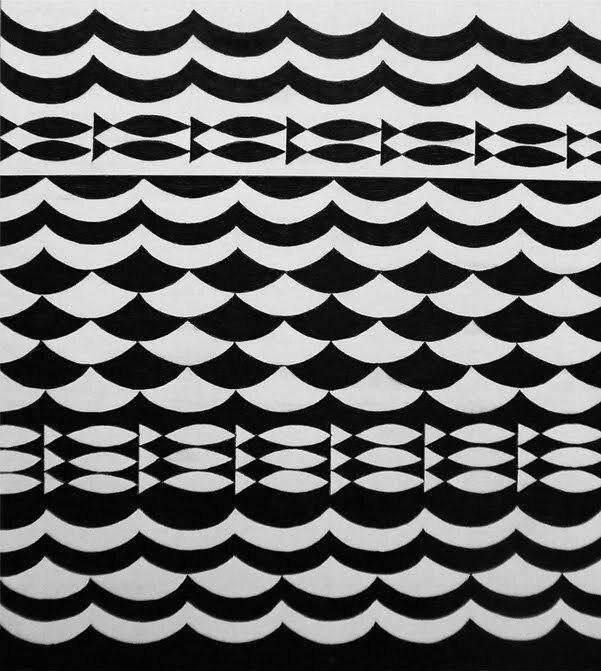 The different forms of numbers add some variety and keep the eye moving around the painting. I'm grateful for many things, but today I want to give a special thank you to Dana over at her blog Leilaloo for posting my interview in her ongoing series about balance and motherhood. I love Dana's artwork, and this series is a great topic because, let's face it - it's not easy to balance any kind of career (let alone a creative one) with being a mom. And another BIG thank you to everyone who has already purchased one of my calendars. They are almost sold out, and I am so grateful to everyone who chose to spend 2011 with me. :) I have to mention the calendars here because my husband, Christophe, is now making fun of all of my posts about them. 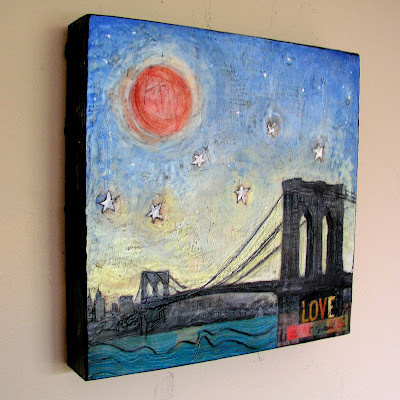 I've also just posted the original Autumn in New York painting on my etsy site. It's now for sale here. Wishing you and your family a happy and safe Halloween!! 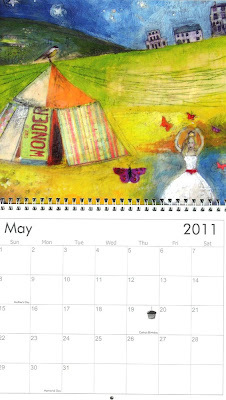 I've had so many requests to see the paintings chosen for my 2011 Calendar, that I finally had to succomb to the popular demand (plus, I LOVE to turn over calendar in the stores to see what's inside). Here they are. I hope you like my selections. There are still a few more calendars left at my Etsy shop. Click here to buy. 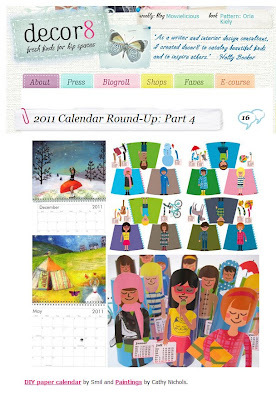 Just wanted to shout out a big "Thank You" to Holly at Decor8 for featuring my 2011 Calendar in her annual round-up this year. I feel so honored to be among such gorgeous creations. Click here to check out the rest! 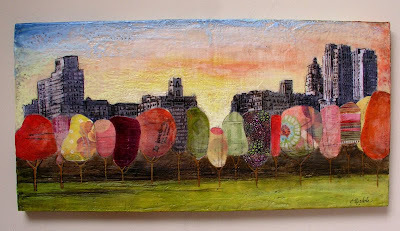 12x24 inch original encaustic painting: "Autumn in New York"
Okay, this one is my new favorite. It took me an entire afternoon just to cut the paper out for the trees, and let's not even mention the fact that I etched EVERY single window with my metal stylus so that the buildings would be 3D. Aside from this efforts, I am just really happy with this piece: the colors, the theme of Central Park, and the sky (modelled after the many beautiful sunrises and sunsets I have been watching lately from my bedroom window). I haven't yet photographed the original on the wall, but when I do it will be for sale in my Etsy shop. Yay! 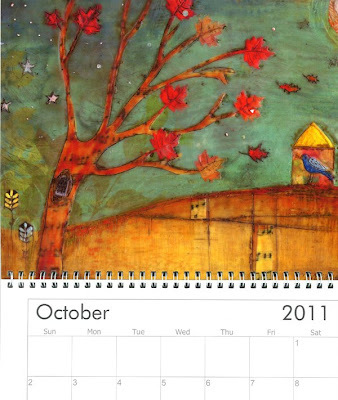 My 2011 Calendars are here, and I think they are the prettiest calendars I have produced so far. 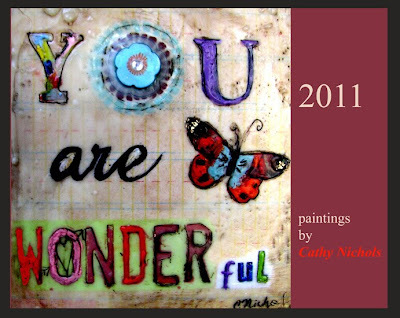 I've titled 2011, "You Are Wonderful" because it's exactly how I feel about anyone who would buy a calendar featuring 13 of my paintings! Also, I think it's a nice cover for a gift - who doesn't smile when opening a calendar that says you're wonderful?! 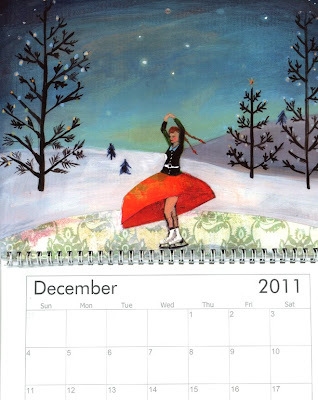 This calendar has mostly images that I've painted over the last 12 months and all but "december" are encaustic pieces. A big thanks to my husband for scanning the calendars in full today so that I could showcase the 'calendar' part of the images. The scanner he used was fantastic and really captured the vibrancy of my colors. 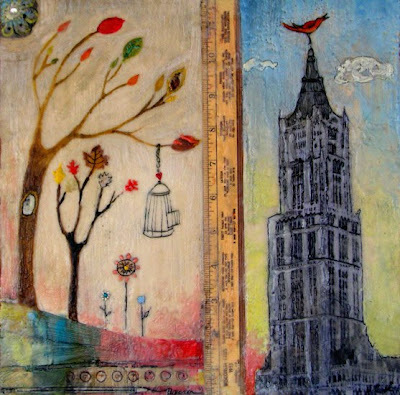 16x20 inch original encaustic & mixed media on 1 3/4 inch wood panel. For sale here. 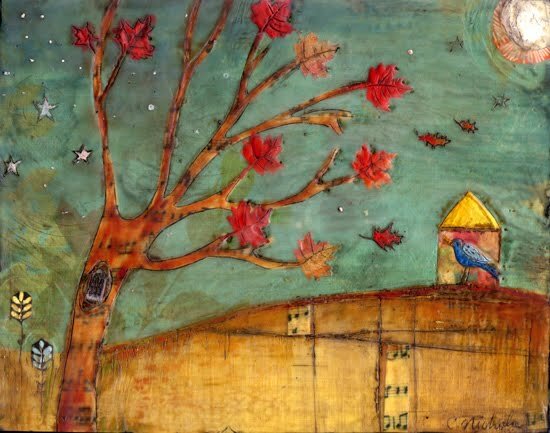 This is the sequel to my painting, "Autumn Lullaby." In that piece, I was imagining that Autumn was a time when the earth was "falling" asleep. Then I thought that winter - with its long, frozen hibernation - might be a time not only of sleep but of dreams. What would the earth be dreaming about? This is my interpretation. So, while there is a winter scene at first glance, upon closer examination, we can also see flowers, butterflies and birds hidden in the icy colors. 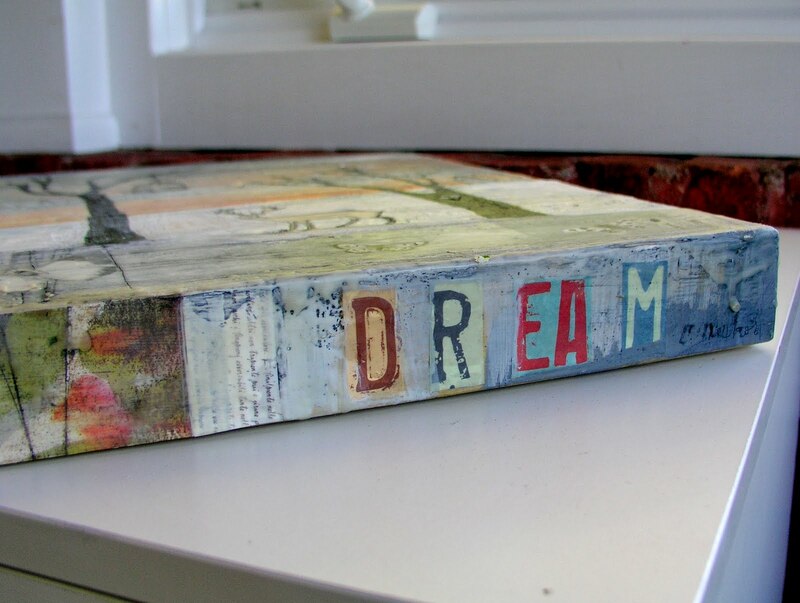 On the bottom of the panel, I added the word "DREAM" in color (so it is really hidden from most viewers who look at the painting head-on; it is beneath the surface like dreams themselves). This is my new encaustic piece. I woke up a few mornings ago before dawn, thinking about the leaves blowing on the wind. Then I had this image of a tree cut through with missing leaves while one leaf was being squired away by a resourceful bird for his new nest. The word "HOPE" in the tree was an added bonus. I just found this piece of paper lying around with the word on it and thought, perfect! It was meant to be. But I do like the sentiment of this piece very much. It makes me think about our emotional history that falls away like dying leaves in autumn. And sometimes we mourn these losses. But it's important to remember that they are never truly lost or gone from the world. Even a brown leaf, withered and faded from its former brilliance, can be used to build something new: a blanket for the frozen ground, a plaything for children... a nest. 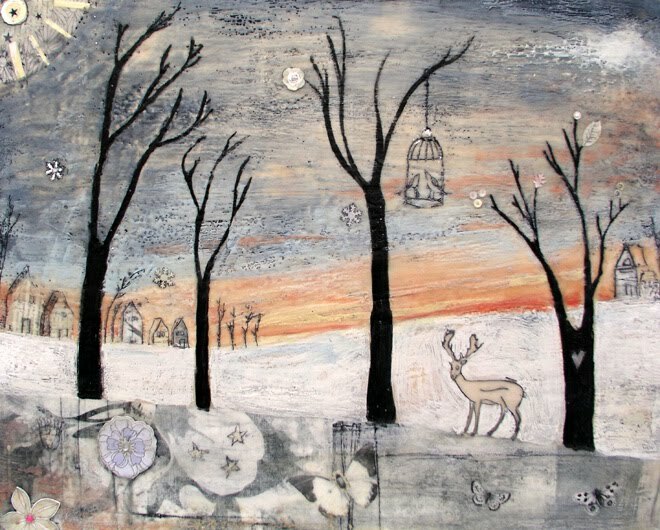 "Till the Stars Fall Down" - Encaustic and mixed media on 1 3/4 inch panel. Prints for sale here. This is my brand new encaustic piece -- it features the Brooklyn Bridge with a view of Manhattan. It took me about a million years to paint the sky and stars just right with wax. 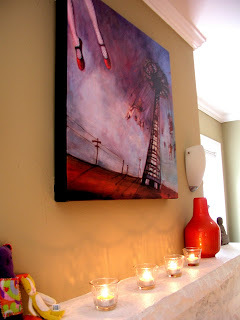 Plus I dripped clear wax downward onto the painting for a 'falling star' feeling. I really love this one... not sure about my favorite part, but it may just be the groovy water that I added at the last minute. This is a BIG change for me! This is my first foray into JEWELRY! 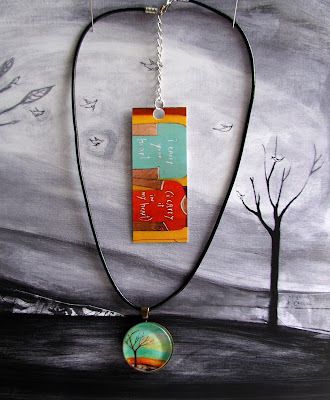 These two pendants are created from my paintings: "When One Door Closes, Another Opens," and "Pretty Lady." Each piece is set in a silver square and coated with glossy resin. 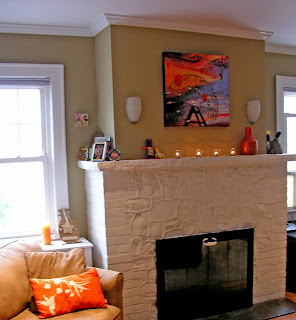 And, at the suggestion of my friend, Lisa, at Caffe Portofino, I've dangled them on simple leather cords. Buy one here! Gorgeous drawing for "Change" by Claire -- who is in the oppostite time zone from us here in the United States. For Claire, the season change is Spring, not Autumn, and she has fittingly rendered a floral tree! 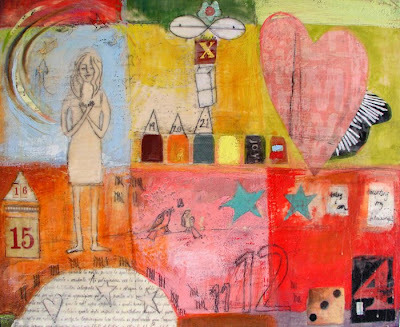 Beautiful "Change" painting by Esther. 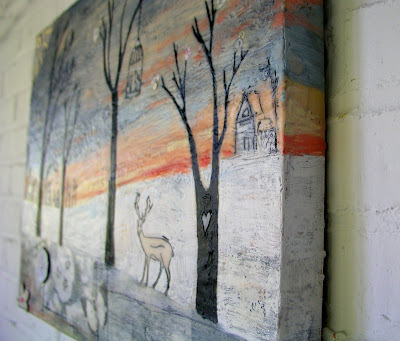 And I love her blog post about this process of creation. So cool. Thank you, Esther, for contributing this lovely piece. This is a new painting I finished today (the children are back in school!). 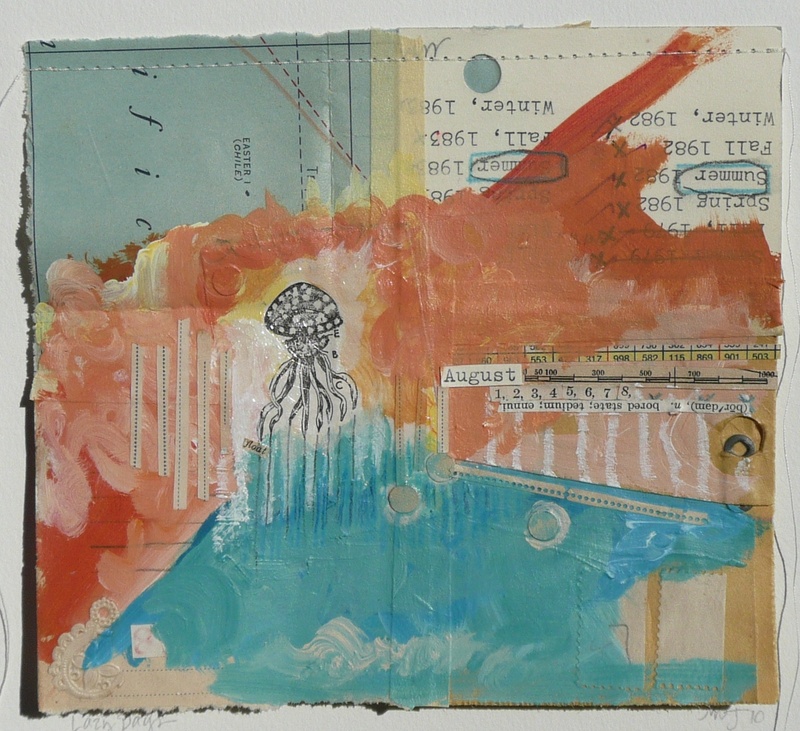 It was inspired by thinking about our "change" theme for this month's Found Art Friday. I was thinking, of course, about the change of seasons and the word "Fall" in particular. I started thinking that Autumn was like the earth falling asleep for the cold hiberation of winter. So I incorporated music into the painting to convey a lullaby for this restful slumber. Please join us for FAF this Friday. This may be my entry, though I do have another "change" I might be able to share as well!! Send me your blog link or jpeg, and I will post your creative interpretation of "change" at the end of the week. 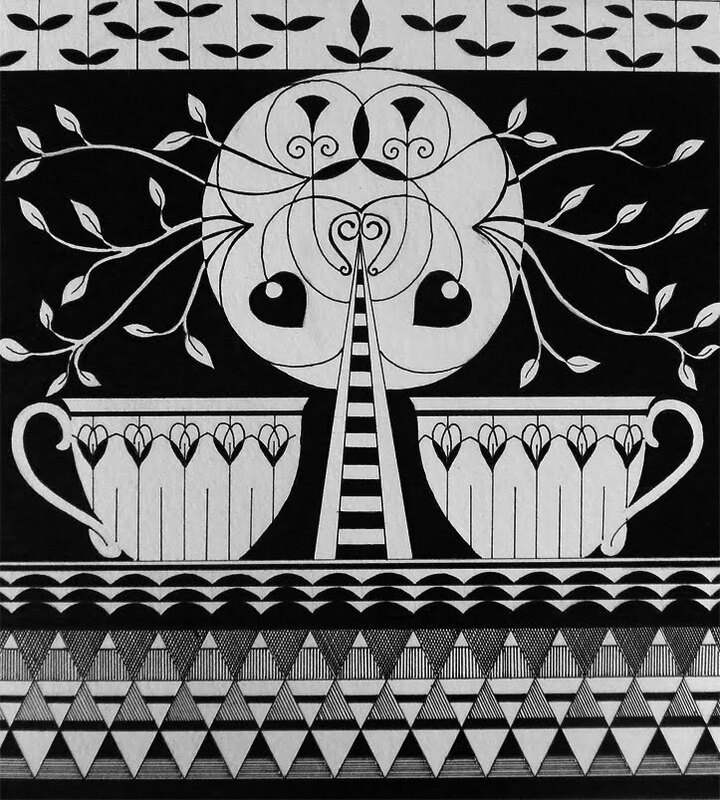 The wonderful Enormous Tiny Art Show opens tonight at the Nahcotta Gallery in Portsmouth, NH. I have 7 pieces in the show, and 4 are still available for sale! 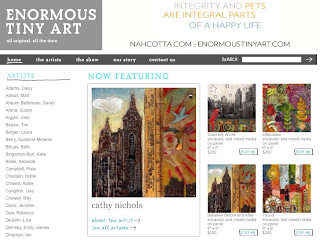 If you are uable to get to Nahcotta, you can still purchase any of the great paintings online at the Enormous Tiny Art website. 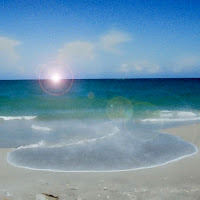 'To the Sea" Digital Photo of Jupiter Beach, the Atlantic Ocean by Cathy. "Lura" Acrylic on Wood by Melissa Moss. "Thank You" Oil On Canvas by James Johansen. "To the Sea" by Jeanette House. "To the Sea" by Jenny Blair. 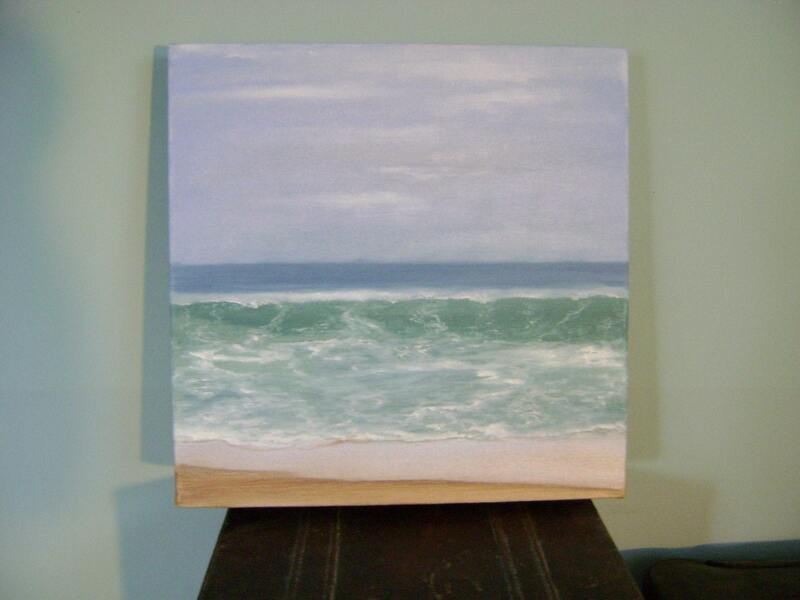 Sea Green/To the Sea by Louise Gale (our lovely co-host!). 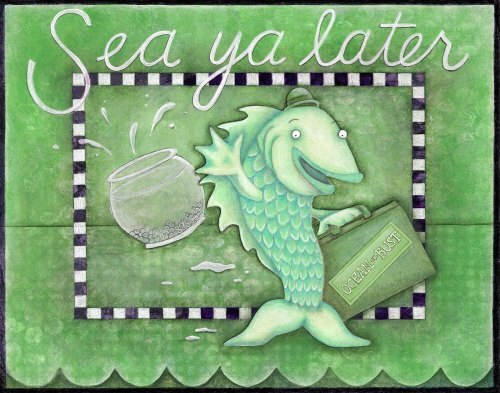 "Sea Ya Later" by Kristin Dudish. Digital Art "Crystal Wave" by Nutty. Black Marker and Colored Pencil on Background from Hand-Painted Fabric by Sheila. 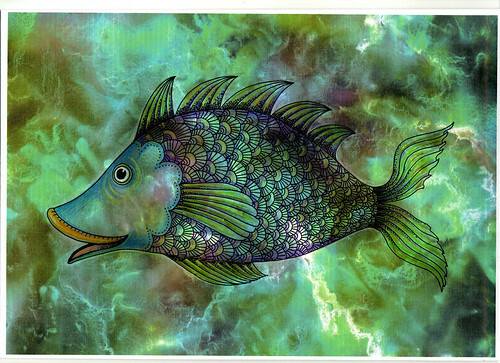 "Under the Sea" by Pippin. WOW. What can I say? 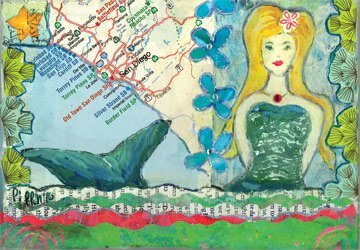 Look at all the fabulous entries or this month's "To the Sea" and "Sea-Green" Found Art Friday and Creative Color Challenge (courtesy of Louise Gale)! I had the most fun reading through all of your blog posts about creating these pieces. There were so many techniques used! I am so impressed by everyone's work, and it was heartwarming to meet so many new blogger artists due to my collaboration with Louise. I do want to add a little note about my own process here, too. As you can see, I submitted a digital photo this time. This was actually a last minute choice after throwing out not 1 but 2 encaustic pieces based on the same image. 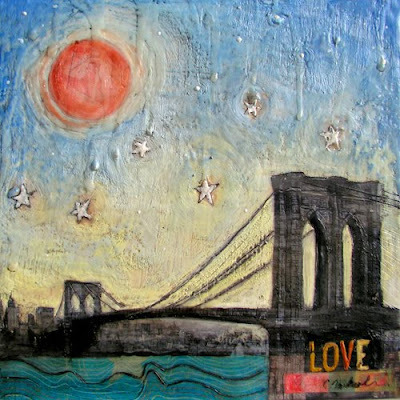 I thought I would try out using encaustic wax on top of a digital photo, but, honestly, I hated the result. I like to think that I can fix any piece of art with enough effort, but this was the exception. And it got me thinking about a few things. First of all, there are some things we simply cannot fix (in paintings and in life). Not everything is meant to be. And, secondly, I am a much better artist when I use my imagination or try to tell a story than when I just go with pure aesthetics. So this Friday, I "found" not only a lot of new artwork & artists to admire, but an important lesson about my own voice. Truly a useful exercise!! Thank you all so very much for participating. If you would like to join us again next month, our theme here for FAF is CHANGE. 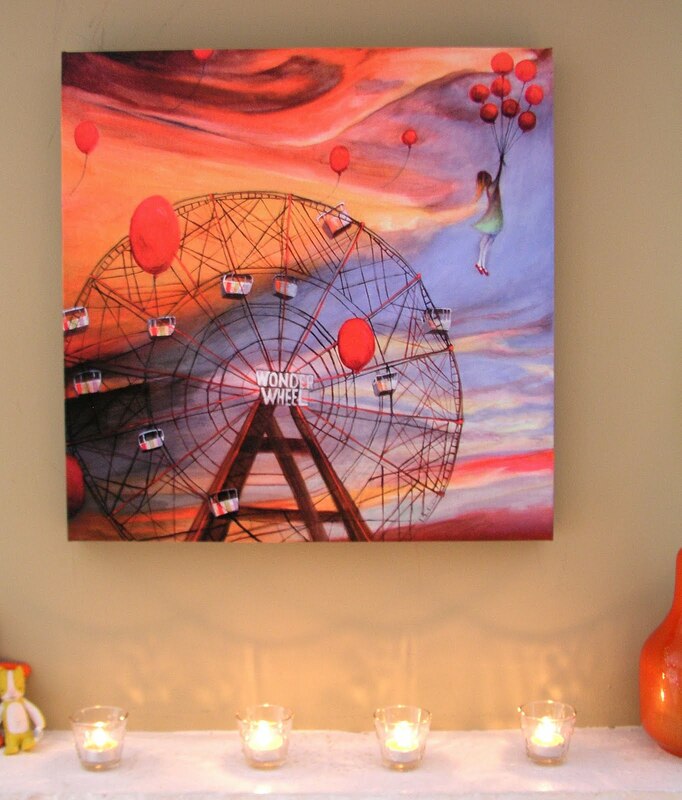 24x24 inch giclees of "Spun" and "Aloft" are now for sale at my Etsy shop. I am SO excited that I have been able to reproduce my paintings onto giclee canvases! And I have to say that "Aloft" looked so cool in my living room for the photo shoot that I was tempted to order one for myself (this one is sold). You can order any print in my collection! 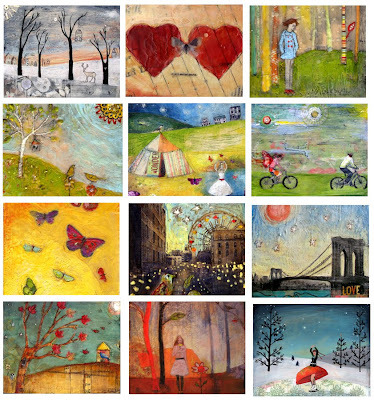 This Friday, I am happy to announce that participants in Found Art Friday will have another opportunity to post their artwork to the blogging community. 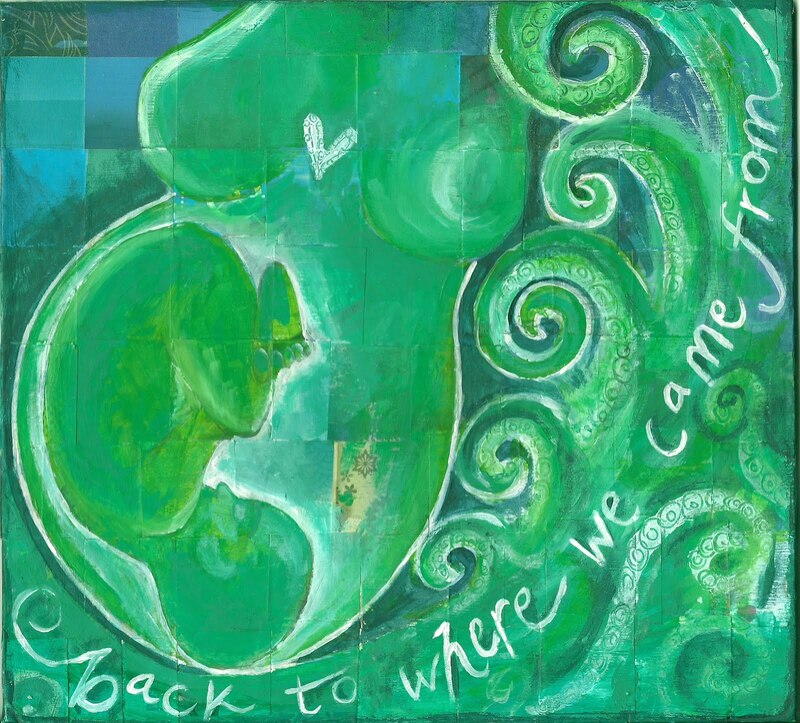 When I spoke with Louise Gale last week, we realized that our themes of "To The Sea" and "Sea-Green" (the color for Louise's current Creative Color Challenge) were perfect complements! So, if you are doing a "To the Sea" piece for this Friday, you can also have your work featured in Louise's Creative Color Challenge. To participate in Found Art Friday, either blog about your "To the Sea" piece and send me a link (or just a jpeg if you don't have a blog) by Thursday August 26th. 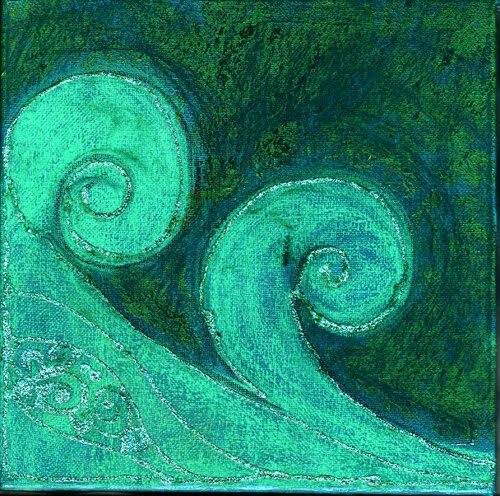 For Louise's blog, create your piece using Sea Green with the theme "To The Sea" and either blog about it or post your image to her flickr group by Thursday Aug 26th . 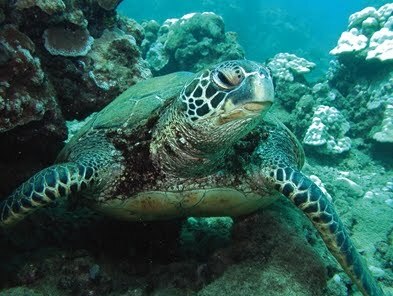 To learn more about the Sea Green Color Challenge, visit Louise's post on the subject. To send me a link to your "To the Sea" artwork, email me at cnichols19@aim.com! I look forward to seeing your creations!! I first heard about this movie on my friend Marisa's blog last year. Then, today at the pool (our last glorious day of vacation! ), I met a lovely mom who said she went to see Babies in Brooklyn Heights and was astounded to see so many moms with their transfixed babies in the audience. With not much else to do this evening, I decided to rent Babies for Annabelle (3) and Nicky (2). Well, it was truly amazing. I have never posted about a film here on my blog. But I cannot resist sharing my children's reaction to this movie. Nicky never watches TV, but he and his sister sat riveted for 40 minutes watching this story of 4 globally different babies' first years. It was SO cool. I had to drag them away for bedtime. Nicky even tried to explain to his Papa over the phone about the film. He said "paint. paint. babies" and rubbed his head -- illustrating the way that the African mom painted her baby's head red. The most amazing thing about this documentary is that it illustrates the incredible diversity of cultures for babies using protagonists who are just like themselves - babies, too. We like to tell our kids, "hey, eat your vegetables, there are children starving in Africa," but they have no context for what this means. I imagine, like most artistic documentaries, this one was created for adults - but it seems like the filmmakers have inadvertently made a masterpiece for children. Like I said - SO COOL. It's almost time for the Enormous Tiny Art Show 8 at Nahcotta. The show opens on Friday September 3rd from 5-8 pm in Portsmouth, New Hampshire, and I am showing 6 new original encaustic paintings. You will, of course, recognize them as the 6-part story/series I have been working on this summer. 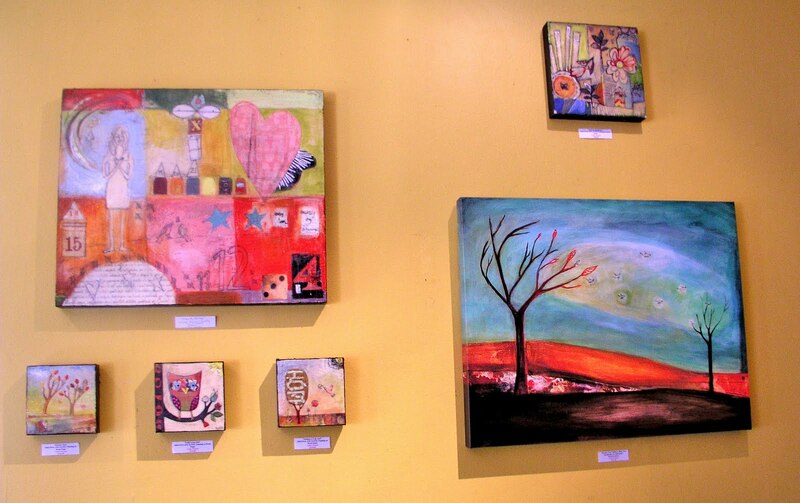 I'm also thrilled to be the current Featured Artist on the show website! All of my new originals are available for purchase right now online through the eta site.